“The management and analysis of the large amounts of data—including the ability to convert and manipulate this data into meaningful insights for senior management—will be one of the key business skills in the future.” This conviction led Wajahat Ali to apply to the NYU Stern Master’s Program in Business Analytics. Mubadala is an investment and development company supporting the diversification of the UAE by investing in key social infrastructure and creating globally integrated industry sectors in Abu Dhabi. The healthcare unit is helping create a thriving, private healthcare sector for Abu Dhabi by establishing long-term partnerships with renowned international medical institutions to build sustainable businesses, create regional capability, and stimulate the overall development of the sector. Wajahat, 29 and married with a young daughter, is a native of Islamabad, Pakistan. He spent his high school years in New York City and graduated from Brigham Young University with a degree in management with a focus on finance. He also holds the Chartered Financial Analyst (CFA) designation and is a member of CFA institute. 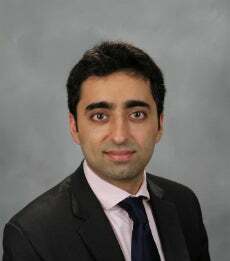 Prior to joining Mubadala in 2009, he transferred to Ernst & Young in Abu Dhabi after a stint in its Los Angeles office in order to be closer to his extended family in Pakistan, and to gain exposure to a fast-growing, emerging market. Because of its design, the MSBA program, he continues, suits both senior managers, “who can benefit from the broad understanding to be effective consumers of data and support data-driven decision making, as well as very specialized managers from healthcare, information technology, and multiple other industries.” The program’s breadth will complement the latter’s specialized skills and enable them to effectively communicate with senior management, he says. Stern’s MSBA program is structured to allow for minimum disruption for working professionals, Wajahat says, and “enables them to get their master’s degree in an effective manner in a reasonable amount of time.” The demands of balancing work, life, and study have boosted his efficiency in this regard, he notes, and he manages to find time to run, play a bit of cricket, and enjoy Abu Dhabi with his family. As for the future, Wajahat looks forward to advancing within Mubadala. The MSBA degree will enhance his expertise and, he expects, his growth within the company. “I understand the different challenges faced and the value a degree program such as MSBA can bring by introducing formal models and advanced data analytics techniques. In addition, the cross learning of best practices from other analytics managers within the program is a valuable opportunity,” he says.